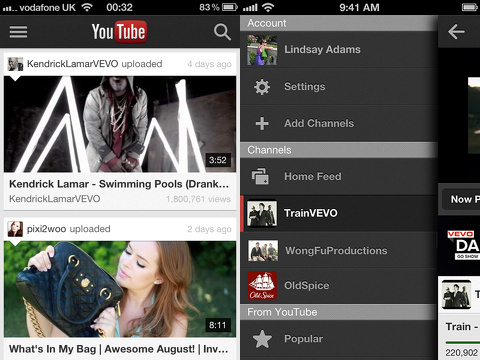 Google nailed it with the new YouTube iPhone and iPod Touch app. Just in time for Apple’s new iPhone (5) & iOS 6 announcement tomorrow, the new YouTube app is out & available for download in the App Store. The YouTube app successfully distills the vast amount of YouTube content, delivers easy navigation, and effective features with intuitive functionality. So, perhaps, it was a good thing for us that YouTube was not included in iOS 6. When you open the YouTube iPhone app, you’ll notice a nicely organized screen with popular videos. The name of the person or organization who posted it and time of post frame the top part of the still shot from a video. The bottom part of the photo in the feed contains the title and number of views. This strong visual presence and succinctly detailed information fills not only the opening feed, but all of your channels and feeds as you explore the YouTube iPhone app. You scroll through this feed vertically with responsive gestures. 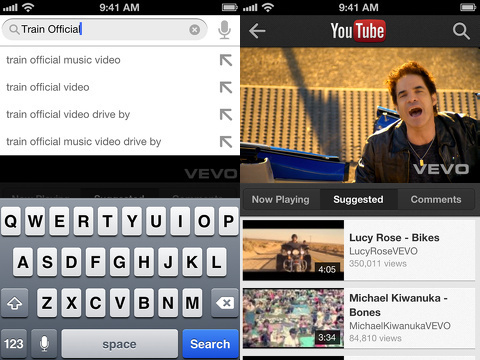 The YouTube iPhone app incorporates a sliding menu from the left side of the screen for ease of navigation. The categories and selection of features are clearly outlined. Your profile is at the top of the list and accessed by a quick authorization with Google. You can check out your channels, adjust settings, and explore topics like film, autos, sports, education, and gaming with one touch. At the top of the screen throughout the YouTube app, you can always press the search icon that remains at the top right hand corner of the screen. If you subscribe to a channel, you can sort through the feed with one touch options at the top of the screen, so you can quickly find videos and playlists. You can quickly add a subscription with one touch as well. When you select a video, you are transported to a neatly organized screen. The video fills the top portion of the screen. It immediately plays, and with a touch on the video, options to like, dislike, make full screen, and monitor the time appear. The share icon that also highlights with a touch is loaded with functionality. You can share to Google+, Twitter, and Facebook, as well as email, message, and add to clipboard. You can add to your watch later feed, favorites, a playlist, or flag as inappropriate. The speed of the sharing process was impressive, as videos may require larger load times. There was no lag when I selected a video, converted it to full screen, or shared the video. With one touch below the video, you can find suggested videos and comments. The ease with which you can comment on the YouTube iPhone app may be a blessing and a curse, since YouTube comments are not widely known to be particularly insightful. A functionality that could be finessed is your profile. When you touch your profile, there is a list of selections–uploads, playlists, purchases, history, watch later, and favorites. It would be nice if these options were available with one touch from the sliding left menu. It would be entirely possible to make these categories available with one touch instead of two. The most impressive aspect of the YouTube iPhone and iPod Touch app is its dramatic improvement over the previous iOS app and the website. It is lightning fast, extremely responsive, visually impressive, and simply navigated. I can’t wait for the iPad optimized version. AppSafari review of YouTube was written by Jenni Ward on September 11th, 2012 and categorized under App Store, Featured, Free, Video. Page viewed 4346 times, 1 so far today. Need help on using these apps? Please read the Help Page.